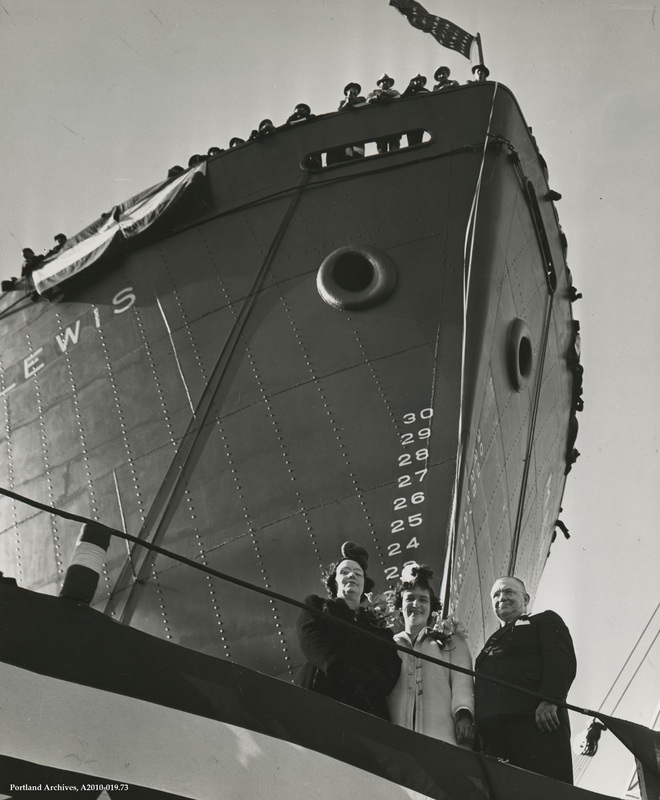 Mrs. Earl Riley, Doris Lee Riley, and Mayor Earl Riley at the launching of SS Meriwether Lewis, October 19, 1941. The lack of details on this picture caused me to dig a little. Some others may be able to elaborate further. She was constructed at Kaiser Shipyards (which yard i could not determine), and was sadlysunk by torpedo with entire crew lost on March 2nd, 1943. Much respect to her and service of the crew. Can anyone identify what that flag is that is flying above the ship? I’m not a military person, and I don’t ever recall seeing it before. Thanks in advance. @ Paul: It was the Jack of the United States. A flag flown on the bow of US ships (Navy and other government ships, like NOAA, Coast Guard, etc.). Per the link to wikipedia, it was replaced September 11, 2002 by the “Don’t tread on me” flag used today. Having grown up in Portland, I had never heard of Mayor Riley. Thank you Adam for the add’l info re the ship’s/crew’s fate. This is one example of the important role Portland played in winning the war in multiple theaters. During the war my grandfather and many others worked in north Portland at a carbide plant supplying acetylene gas to the shipyards. Vanport is another example of the sacrifices (and cultural effects) of the war efforts. Does anyone know how many Liberty ships and others were laid in Portland? Is that a pretzel hat on Mrs Riley? I never knew that was a ship named after Lewis. My wife, children & grandchildren are distantly related to him. . I never knew about the Union Jack flag. Using the link I was able to determine that the current one in use is the 50 star on a blue field, although I like the Don’t tread on me version and I will try to locate one to fly beside my current flag. Thanks for all the research.